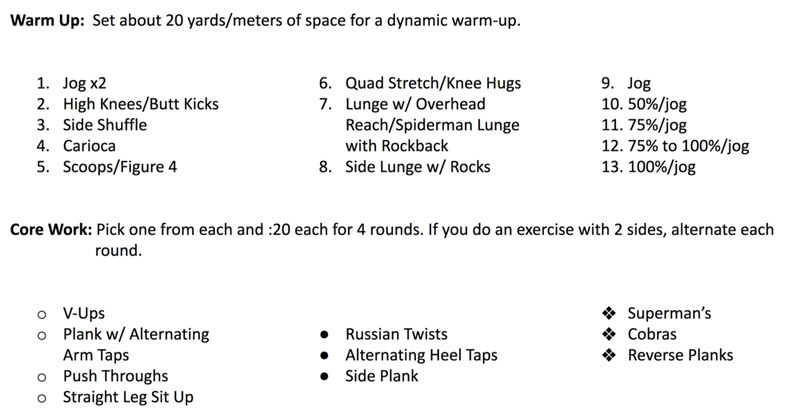 Here's the new week of workouts. This week's strength training is focused on a Push/Pull style template. Push/Pull is utilized by everyone from athletes to body builders and can even be found in a rehab setting. It's popularity is due, mainly, because of how efficient it makes the training session. Another great byproduct of the pairing of exercises is an improvement in general fitness. Using a push-pull style will allow you to perform exercises in the same set without making the muscles too fatigued. For example, a bicep curl (pull) and a tricep extension (push) would be paired together to maximize the repetitions and muscular time under tension, without exhausting one muscle or the other. This week's conditioning is going to be done on a field or track and you will need a stopwatch and markers for each day. 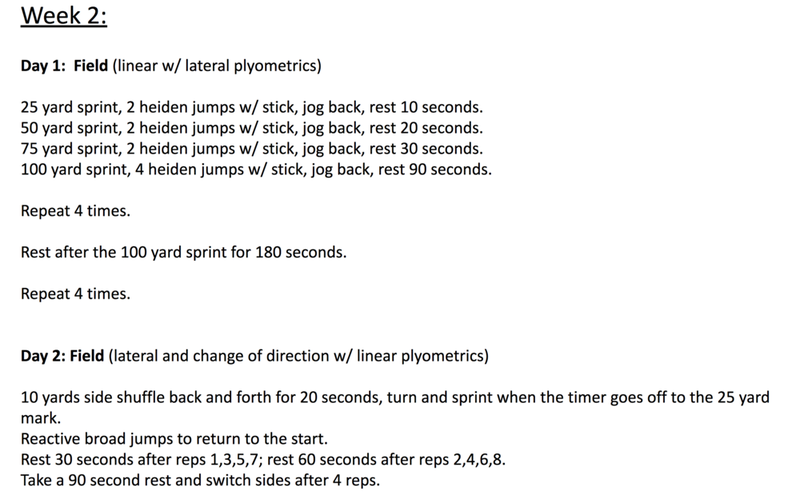 This week we will be adding more plyometric work in in the form of heiden and broad jumps. This is a tough week! If you finish up and realize you're in need of some Movement Therapy, please check out SAPT coaching alum Jarrett Brumett! 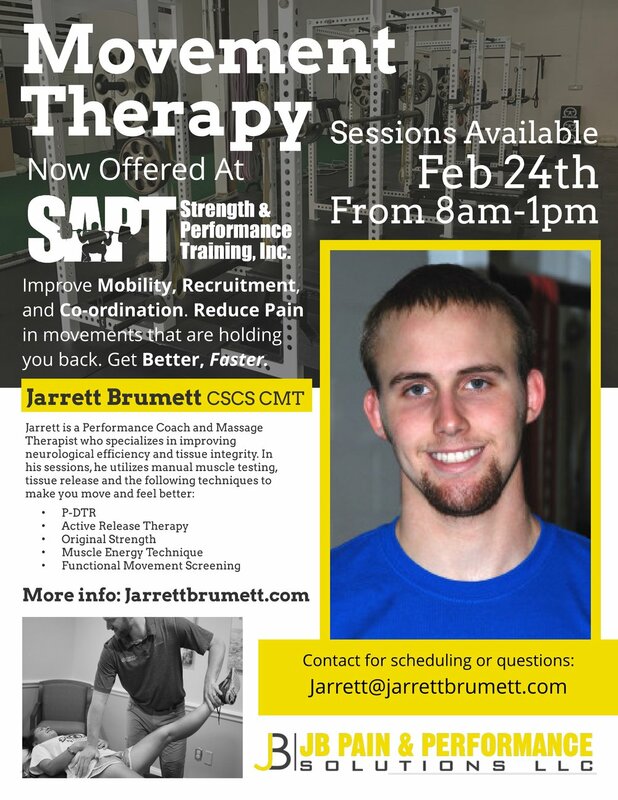 Jarrett will be in at SAPT this Saturday offering one-on-one sessions. Jarrett has been described as a miracle worker by many (I'm serious) and can often find mechanisms of injury or pain when all others have failed. If this describes you, please reach out to him! Enjoy and let us know if you have any questions or need a form check!